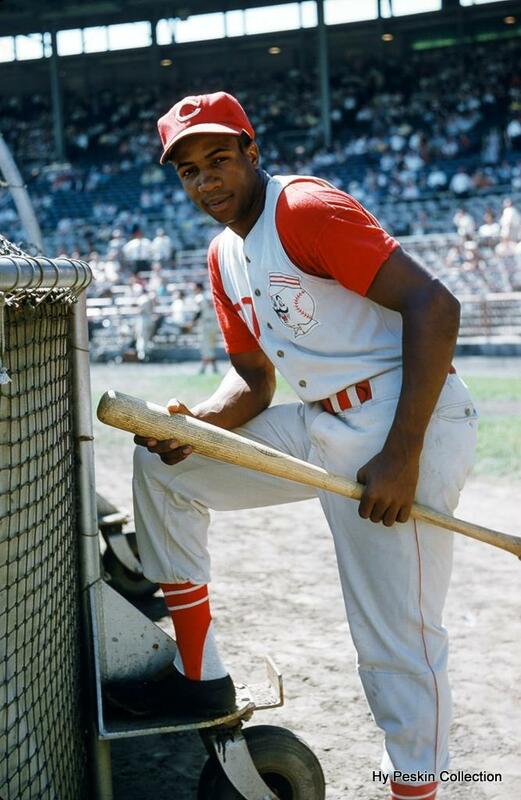 A quick post to denote the sad passing of Hall-of-Famer Frank Robinson, today at the age of 83. The accolades are many: Rookie-of-the-Year in 1956 (photo above taken August 12, 1956, in County Stadium, Milwaukee by the renowned Hy Peskin) including a then-record 38 home runs by a rookie, and also led the NL in HBP, indicative of his fearless, close-to-the-plate batting style; also, the only player to earn the MVP Award in both leagues, 14-time All-Star, the AL Triple Crown in 1966, 586 HRs (4th all-time when he retired), 2 World Series titles, and of course being the first African-American manager, with the Cleveland Indians in 1975. So what more can you say, but here’s to you, Mr. Robinson. Thank you Tom for the most important post of a baseball icon in the ranks of Mantle, Mays and Aaron. He was the most fearless hitter in the history of the game. Don Drysdale would knock him down and Robby would get back up and slug the next pitch over the fence! He was a leader of men – a no-nonsense guy who believed the game should be played with a passion to excel and win. I always respected Frank Robinson, maybe like no other player and I will miss him greatly. Frank was a murderous hitter, crowding the plate mercilessly and never giving in to any pitcher. As you have said, he has the credentials to rank in the top five of all time.